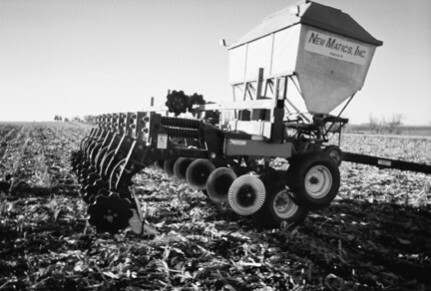 This producer modified strip-till equipment to inject fertilizer at and below the seeding depth for crop nutrition and long-term soil improvements. Ron Lampe wants fertilizer placed into the soil profile exactly where it will do the most good. That’s why he’s adopted a strip-till system that injects fertilizer at two distinct depths. His goal: fertilize at and below the seed to expand the beneficial soil profile. FITTING THE BILL. Ron Lampe tried various equipment components before finding the above combination, which was rugged and precise enough to inject fertilizer into two targeted zones at once. Lampe farms near Havelock, Iowa, with his brother, Tom. He’s been no-tilling since about 1988, when he purchased his first rig to more effectively farm highly erodible land. Lampe slowly expanded the use of no-till on his heavy, black soils each year. Today, he no-tills the entire 1,600 acres of corn and soybeans. In addition, he raises hogs for New Fashion Pork on two sites, each with a 4,400-head capacity. His current strip-till rig (shown at right) is the newest generation of a unit he designed to place fertilizer in two zones, one at 4 inches deep and one at 12 inches to 14 inches deep. “I can go as deep as 16 inches with my current unit if the soil profile demands it,” he says. His current fertilizer program is to inject 130 pounds of 18-46-0 and 200 pounds of 0-0-60, with 10 pounds of sulfur and 5 pounds of zinc, per acre. The fertilizer is split, with half going into each zone. Lampe’s fertilizer rig consists of a New Matics air system, a Brillion Zone Commander, a cart from Elk Creek (Nebraska) Welding and disc closers mounted closely behind the Zone Commander. The hoses, purchased from Montag manufacturing, run to each shank on the Zone Commander, and each splits at the two depths to inject the dry fertilizer. So far, it’s a system that’s worked well for Lampe. Previous units had a maximum depth of only about 8 inches. Lampe didn’t want to settle at 8 inches, but the shanks of previous units couldn’t handle more depth the way the standard shanks on his new unit can. “On my previous rigs, the shanks would trip or break if I went deeper. This current unit can handle up to 16 inches deep," he says. It’s been a long, slow process to refine his current system, Lampe admits, but the effort has been worthwhile. “My main reason for using a strip-till unit is to help build organic matter in the soil,” he says. Today, he notices that his soils can handle dry weather much better, and he has few problems with compaction or soil crusting. Lampe notes that during a particularly wet period, he needed to get out to the fields to spread manure. Needless to say, the equipment rutted the fields. In addition to his strip-till rig, Lampe injects hog manure 6 to 8 inches deep. “That’s a real bonus to have manure to add to the soil profile. It helps boost the organic matter, and it’s a free byproduct from the hogs,” Lampe says. Lampe is always working on his strip-till system to get the most out of it. Next on his agenda is an automatic guidance system, as well as a variable-rate controller for fertilizer placement. And a variable-rate fertilizer system would help to further define his soil profile and place the exact amount of fertilizer where it’s needed most. “Right now, I’m covering the fertilizer needs above and below the seed. A variable-rate system would let me fine-tune the placement," Lampe says. Lampe already has a strict manure management program in place, and he hopes to use his strip-till system as part of his qualification for the Conservation Security Program. What he does note is that because his soil is healthier, his crops are better able to withstand a lack of rain. Anyone who is considering a strip-till system like Lampe will need patience.